Home › Events › Food Drive Boxes Filling Up—>A Peak At This Week’s Activities!! Borgida & Company’s 12th annual food drive is underway! We caught a few loyal Borgida & Company clients in photos while generously donating to our campaign. Recognize anyone? 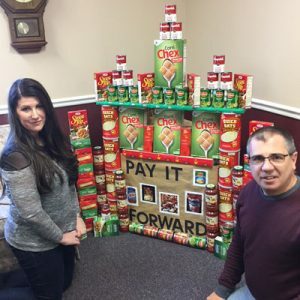 Buckland Hills BNI made a generous contribution to our food drive. Filling up our lobby!! Thank you again for your generousity! All non-perishable food items welcome. Needed items include tuna fish, stews, canned fruits and vegetables, instant potatoes, dried pasta, dried milk, soups, peanut butter, rice, and “sugar free,” “low sodium,” or “no salt” items. Personal hygiene items & toiletries also are appreciated. Who’s that in the adorable yellow boots? Any guesses? 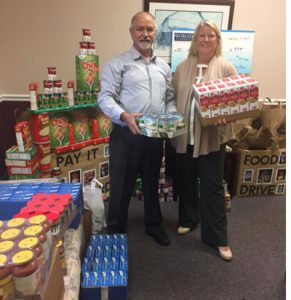 That’s Forensic Accounting Services, LLC Stephen Pedneault with accountant Rhiannon Crawford constructing another impressive tower of food! Way to go!! Monetary donations always welcome. Make check payable to “MACC Charities”. 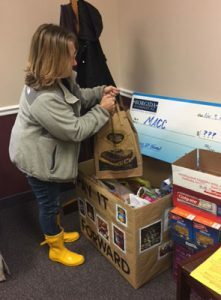 All items collected will be donated to the MACC Food Pantry. Your good deed will help many!! For additional information call (860) 646-2465 or email info@borgidacpas.com. 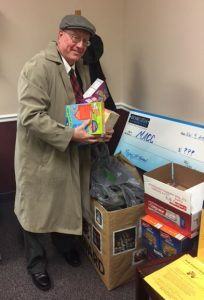 Attorney Mike Darby joining in by emptying his bags of food.